Most of us know that we need to aim for a healthy, balanced diet and regular exercise to maintain our physical health. These same goals are also important when maintaining our mental health and well-being. Many people struggle with balanced eating, being active and feeling good about their bodies. When you diet, a number of changes can impact your physical and mental health. Drastic diets can be hard on the body and increase the risks of medical complications. You might notice that dieting also starts to affect your emotions. You might feel sad or irritable or experience mood swings. You might notice that it’s harder to concentrate and that your thinking can become distorted. For example, eating one cookie may lead you to believe you are a complete failure. When you diet, your body senses a food shortage. As a result, you might feel deprived, preoccupied with food and more sensitive to food around you. Your energy levels might decrease and you may begin to feel tired more often. These changes make it easy to understand why people find diets hard to maintain. Diets, especially drastic diets, are usually not a good strategy for people who want to change their body shape. Many people aren’t very successful at staying on a diet. Most people who lose weight from dieting only lose small amounts of weight and eventually gain it back. In fact, many people gain back more weight than they lost during the diet. Dieting can also have surprising long-term effects. Some studies have found that people who diet tend to gain more weight over time than people who don’t diet. Some diets also suggest that you leave out important food groups, which can affect your physical and mental health over time. Why do so many people diet? Many people feel unhappy with the way they look and want to be thinner—even if they are of normal weight. We are constantly shown thin body images on television, movies and in magazines. These images are unrealistic for most people to obtain. Your genetic background predisposes you to different shapes and sizes. Also, photographs are often touched up and the people in them often have access to extensive body-shaping exercise regimens or plastic surgeries. With all the emphasis on being thin, it’s not surprising that some people obsess about their weight and feel extremely upset about their body shape. Kids and adults who feel this kind of pressure to be thin are at increased risk for turning to unhealthy coping strategies and developing an eating disorder. Why do media images make you feel bad? It’s natural to feel unhappy with your body when you compare yourself to unrealistic images. You’re more likely to feel this way if you already feel down or dissatisfied with how you look, or when you don’t feel supported by the people in your life. It can be tempting to believe that you would be happier if you lost weight. Media images often show that being thin makes you happy, successful and in control of your life. Sadly, there also continues to be widespread discrimination and stigma directed towards those who are overweight or obese. In reality, both happy and unhappy people come in all shapes and sizes. It’s often hard to eat well and exercise when you need it the most. Exercise and healthy eating can help with negative moods, low energy levels and lack of fitness, but these things can make it harder to start exercising and eating well in the first place. Some people find that they eat more in the face of stress, especially food with less nutritional value like junk food or fast food. Other people find that they hardly eat at all. They may also feel too drained to exercise. Remember to take it one day at a time. Each day is a chance to start fresh. Try to remind yourself that healthy living choices are especially important during times of stress and will help you feel better. It is important to look at the source of stress and explore other helpful coping options. See the full range of Wellness Modules at www.heretohelp.bc.ca for more information and practical tips. Some of these options may seem like they help with weight loss or weight control. Unfortunately, none of these strategies work when it comes to maintaining balanced food intake or a healthy body weight. All of these strategies can also be extremely dangerous to your health. Many of these behaviours can be signs that someone is struggling with an eating disorder. There is help for people when their eating patterns or concern about weight and shape begin to compromise their health. Exercise can improve your mental health! Exercise can help your physical health by increasing fitness, increasing energy and building strength. Exercise can also have a positive impact on your mental health. People who exercise often report less anxiety. It may help improve feelings of mild depression and help counter stress. To get this positive impact on your mood, you don’t have to do heavy exercise. It’s better to stay within your comfort zone and slowly increase your activity levels. Be creative about ways to increase the daily activity in your life. For example, you might try doing some mild exercises while watching TV, taking a 15-minute walk during your lunch break or planning a family outing around an activity you all enjoy. Why is it so hard to start or stay on exercise programs? Many people find this difficult. Exercise has many positive effects on mental health, but you may not see the benefits right away. And if you don’t enjoy the exercise, it’s hard to stick to a routine. To get started, think of activities you enjoy and brainstorm ways to build them into your schedule. It’s usually best to start with small, realistic goals. Some people find that it’s easier to stick to a routine when they exercise with a friend or spouse. Yes, you can. Some people exercise when the healthier option would be to rest, such as when they’re injured, ill or haven’t eaten enough. This is more likely to be a problem when people are very concerned about the way they look. Other times, people take on too much because they want to see results quickly. And some people push themselves to keep up with a more advanced exercise buddy. Be gentle with yourself, set realistic goals and make sure to increase intensity gradually. You don’t have to make big changes to improve your wellness and maintain good mental health. When it comes to healthy eating and exercise, every little bit counts! Try adding in extra activity throughout your normal day, such as parking a block from work and walking the rest of the way or using the stairs instead of the elevator. Even getting up to change TV channels can make a difference! Can healthy living be more difficult for some people? Some people find it especially difficult to maintain healthy living choices and a positive attitude about their bodies. Below are a few factors that can make healthy living more difficult. 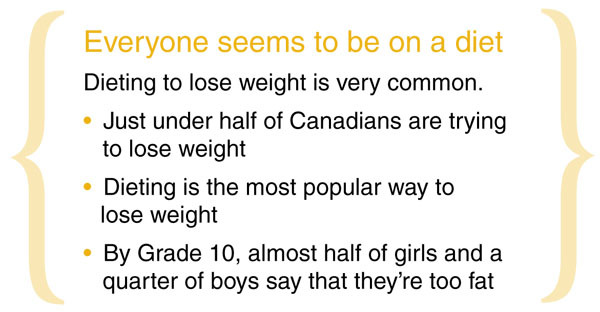 Increased pressure to look a certain way: Teenage girls and boys, athletes with weight restrictions (like wrestlers or jockeys), dancers, models, actors and gay men are especially vulnerable to disordered eating given the high social pressures they face to be thin and fit. Health problems: Your appetite and energy levels can be influenced by chronic illnesses (such as diabetes or Crohn’s disease), pain conditions, mental illness, medications (for physical or mental health problems) and other medical treatments. Both health problems and treatment options can affect your wellness goals. Low income: Poverty can have a large impact on your ability to access a full range of healthy foods. The costs of food itself can be a barrier. People living in smaller or isolated communities may also have to travel to a larger centre to buy a range of food, which can add to the costs. Food choices within the community: Some communities in BC, particularly rural or remote communities, may only have limited food choices available to community members. Lifestyle and food options: Along with pressures to be thin, young people also face more inactive lifestyles and easier access to unhealthy food choices than past generations. Try talking to your family doctor, a trained health professional or local service provider for creative and manageable ways to make healthy choices. Start slow, reward yourself when you achieve your goals, and involve your friends and family in your plan.